Fanning out along a bend in the river near downtown Eugene, the garden is a bright jewel in a long string of popular Eugene waterfront parks. From soccer fields at the U of O to duck ponds and community gardens at the north edge of town, the banks of the Willamette River are the city's favorite attraction, And Owen's roses are at the center of the show. More then 100,000 people a year pass through the garden. The nine acres were once the property of George Owen, a lumberman and philanthropist. 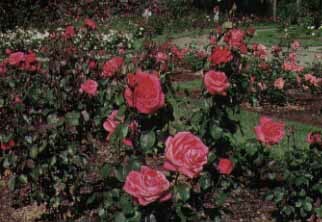 Owen donated the land to Eugene, which began planting roses there in 1950. The garden is open 6 am to 11 pm year-round.